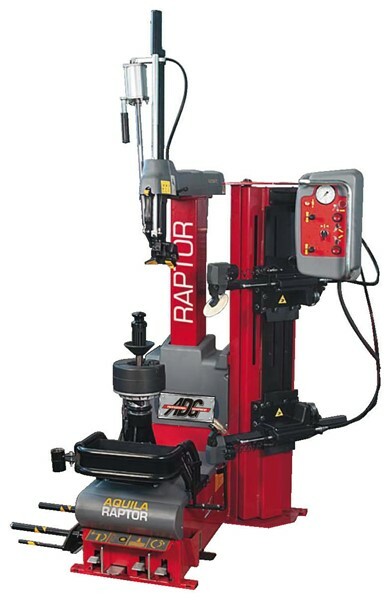 RAPTOR, super-automatic tire changer equipped with a “LEVERLESS” mount/demount device making it possible for the operator to change any type of tire with a minimal amount of physical effort • Extremely simple and intuitive to use, combining work operations that have been learned by tire installers over the years with innovative automation and functions • This tire changer was designed to make it easier to mount and demount all types of tires, especially rigid, low profile and Run Flat tires, including the following: Bridgestone RFT, Goodyear RunOnFlat, Pirelli Eufori@, Michelin ZP, Continental SSR, Dunlop DSST, etc. Wheel clamping with a wheel support plate, a lateral dual bead breaker disc with two independent rollers and the demounting device without lever guarantee this machine’s excellent performance. The demounting device “without LEVER“, integrated in the traditional head, in combination with a multifunctional console, makes this machine truly easy to use and completely eliminates operator effort. Each work operation is supported by functions and features that can guarantee the perfect condition of the rim and tire. Wheel clamping from the central hole without the use of clamps, the automated tire demounting unit without the use of a lever in combination with absolutely efficient and safe bead breaking guarantee operator safety. The perfect integration of various functions, in combination with an ergonomic work station, make work faster in all situations. Aquila Raptor can work correctly on all types of car and light transport vehicle wheels up to 28”, thanks to a complete offer of standard and optional accessories.